King Kong Fury is a 5 reels and 50 paylines mobile video slot powered by Nextgen gaming platform. Coin range for the slot starts from just 25pence per sin to up to £500 per spin. This is one of the best slot machine from the house of Nextgen gaming. 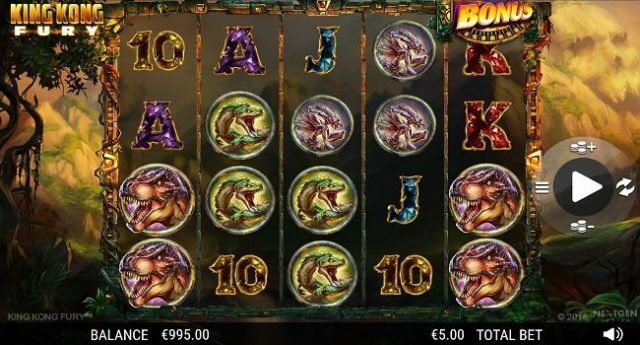 King Kong Fury offers a huge jackpot on your total stake if you land on good symbols. 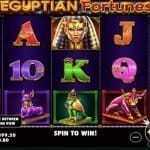 This slot can be played at any devices like mobile, desktop, tablets or laptops using nextgen online gaming sites. 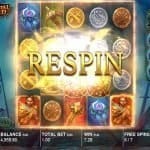 There are 4 bonus rounds in this game one of which is free spins bonus feature where you could win up to 100 free spins. You will also get interacted with 2 randomly triggered bonus features. 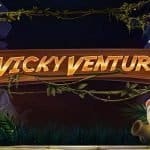 In this adventurous game you will be taken to the Skull Island where Kong battles with monstrous beasts. The game is based on a famous movie on 2017 named Kong: Skull Island. It has some great features involved in it. The game contains symbols like A, K, Q, J, 10 and 9 playing as well as triceratops, tyrannosaurus rexes, pterodactyls, bugs and snakes. Out of these total symbols the tyrannosaurus rex is the most valuable symbol which will offer you 10 times of your total stake if you land 5 of these symbols across a payline. The Kong is the wild symbol in this game and it can replace all other symbols except the Bonus scatter which only appears on 3 of the middle reels like on 2, 3 and 4. As mentioned, this game has many bonus features but the main attraction of this game is the free game feature which can be triggered if you land the Bonus symbol, Anne Darrow on reels 1 or 5 and if this happens you will receive 4 times of your total stake, then to get free spins you will have to spin the statue which would yield either 3, 4, 5, 6, 7, 8, 9 or 10 free spins each.